I think of detoxifying the body as a way to get rid of unwanted or unneeded chemicals that have made their way into our bodies via foods we have eaten, the air we breathe, to lactic acid build up from working our muscles. The Webster dictionary defines detoxifying as: 1) to remove a poison or toxin or the effects of such; 2) to free (as a drug user) from an intoxicating or addictive substance or a dependence on it. So the dictionary looks at it as more drug related, whereas I think of detoxifying as more every day related. This article will cover a little bit of both. So how does massage help someone detox from their drug addiction? According to an article written by Jimmy Gialelis, “Massage therapy’s positive physiological effects, as defined as classic Swedish massage, can support a patient during detoxification efforts. Massage therapy aids in lymphatic drainage, promotes immune system health and function, and enhances an overall wellbeing sensation by improving sleep and relaxation, increasing serotonin and dopamine levels.” Gialelis goes on to state, “Additionally, massage therapy’s psychological effects can support detoxification efforts.” The overall gist is that massage can help a person going through drug detox in a positive way. The beauty of the description given above of how, specifically, massage helps with detoxing the body is exactly how it works any time a person gets a massage. It’s what happens when the body is assisted with moving toxins out. As the muscles are massaged, they relax and toxins are released. Blood and lymph circulation is increased, as well as serotonin and dopamine, as does overall relaxation. This is an all-inclusive package deal. You can’t get one without getting all the rests of the benefits listed. I have worked on athletes two to three days after their sporting events and they are sore. They usually leave my office feeling less sore, more relaxed, and moving with greater ease. Basically they are feeling more normal, not so restricted and in pain. Massage has helped to facilitate detoxing their bodies. After a massage, I encourage an increase in water consumption as this is part of the detoxing process. It helps the kidneys flush out the yucky, unwanted stuff from your body. It’s all part of the process to cleanse the cells and the whole body. Think of it as a renewing of your body. You’re helping to get rid of the junk it has been carrying around. This in turn allows your body to function as it was meant to. Are you feeling yucky? Maybe it’s time for a massage. Source: Integrativehealthcare.org “Detoxifying Effects of Bodywork and Massage”, Jimmy Gialelis, LMT, BCTMB. 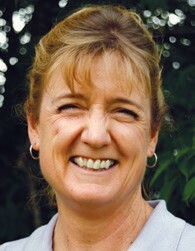 Susan Santi is a certified massage therapist and owner of Ahhh Massage in Virginia, MN. Feel free to contact her with questions at 218-410-2144.